The trip was good; We found a modular piece-it-yourself cabinet that would work but I wasn’t too keen on the doors. I figured, though, that with the amount of storage it would provide I could get over the doors not being quite what I wanted. The price being more than I was ready to pay (windshield wiper fiasco wiped me out there for a bit), I figured out the pieces I would need to make my return trip a quick one … but my Mom had other ideas. She thought a second hand chest of drawers would be best (she did not like the Ikea idea at all … even after I showed her my out-of-season bedding situation) for both price and style and, though she didn’t find anything on her own, we found a great solid wood cabinet when we went out last weekend. I already mentioned the cake and pie carrier I found, but my Mom found this tall dresser while we were waiting for a chair she had previously bought to be loaded into her car. I’ll admit, the fact that it had a $39 price tag on it was a lot more tempting than the Ikea solution, but it needs a lot of work. And I was really wanting furniture that was ready to go. But I argued the missing handle on the left door was worth at least $10 bucks off. 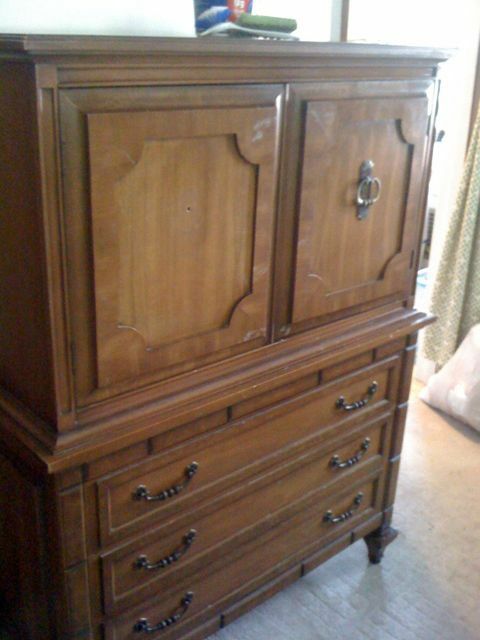 For $29 this Sherrill Furniture dresser is mine! This cabinet is huge – just under 4 feet wide and a shade over 5 feet tall – and it is heavy as hell. 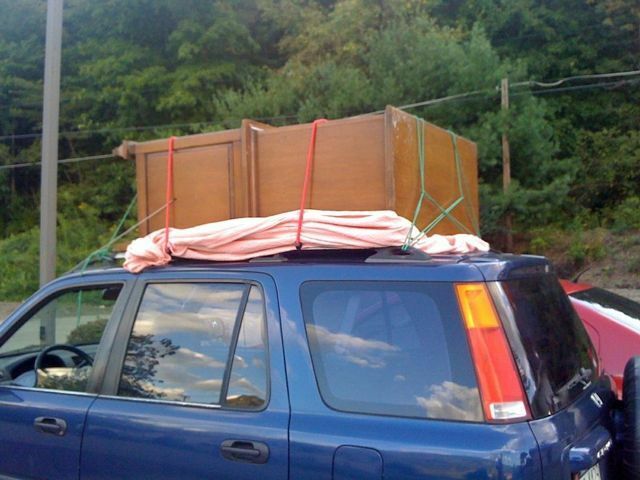 Somehow, with the help of the guys who worked at the store, we got it on top of my Mom’s car … but I had no idea how, without the 2 guys and the loading ramp, we were going to get it off the car and up the stairs into my second floor apartment. Don’t ask how, but we finally got the cabinet untied and into my apartment, albeit upside down, but the key is: it’s in my apartment. After a lot of scrubbing with some diluted Mr. Clean, the piece looks pretty good. 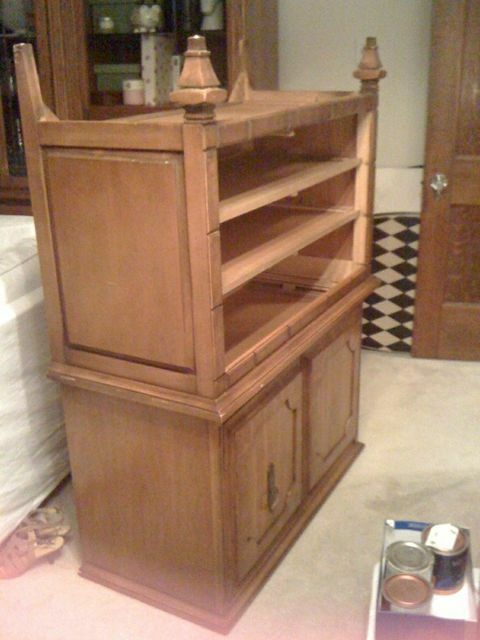 It could use a sanding and I’d like to paint it, but the reviews on that are mixed: My Mom thinks I should go for it and make it a really cool painted cabinet … but the wood is pretty nice and could just as easily be cleaned up and restored. Decisions, decisions!